Arabia Weddings has introduced a new feature on its Arabic and English online wedding planning platform which aims to provide brides and grooms- to-be across the Arab world with an interactive platform to compile and save their favorite content on the website. Once you create your account on Arabia Weddings by answering a few basic questions, you will be able to save any of your favorite content that you come across on the website. Whether it’s a piece of news, or the latest fashion trend, or an image you liked in any of the galleries you saw on the website, you will now be able to click on the ‘Add to my favorites’ heart-shaped icon and save it in your own personal folders. What you’ll see at the top of your personal account is My Personal Folders that includes 6 folders to make it neater for you to save 6 different types of content in them: Tips & Trends, News, Videos, Wedding Songs, Events and Albums. You will also get 3 other folders in your account: My Planning Tools, My Orders and My Gift Registry to keep track of the various tools that you are using or orders for Special Deals that you may have placed. So, create an account now and try it out. Enjoy! Utopia Studio is giving a lucky couple based in Jordan, the chance to win a unique photo shoot session. The bride and groom should share their picture together and collect the biggest number of likes on Facebook! So help the couples win their photo shoot by voting here! Arabia Weddings has been helping many couples across the Middle East select their honeymoon destination, book their honeymoon packages and pack for their honeymoon. We have covered many destinations under our Honeymoon section in Tips & Trends and written many tips and articles on honeymoon. We are now planning our visit to the region’s largest travel trade show, Arabian Travel Market that will be held in Dubai from 5 to 8 May. Destinations around the world, as well as, travel agents, hotels and airlines can take advantage of the hundreds of thousands of monthly website visitors that Arabia Weddings receives and target them to promote their destinations and services. A lot of the services provided by Arabia Weddings is totally free, such as the directory listing, PR and social media support. 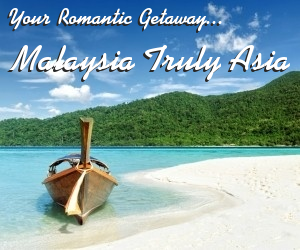 Earlier in March, Arabia Weddings ran a 2-week campaign for Malaysia Tourism to promote Malaysia as a honeymoon destination in Jordan and the Middle East. The campaign was carried out in conjunction with Malaysia’s participation in Jordan’s annual Wedding Show that was held from 3 to 15 March 2014. Meetings have so far been arranged with Dubai Tourism and Culture Department, Abu Dhabi Tourism Authority, India Tourism, Italian State Tourist Board, Spain Tourist Office, Hong Kong Tourism Board, Nepal Tourism Board and other National Tourism Organizations. We are excited to let you all know that Arabia Weddings (www.arabiaweddings.com), the region’s premier online wedding planning platform is launching its services in the UAE! Arabia Weddings holds the largest bilingual online directory of wedding suppliers in the Arab world covering companies in the Levant, the GCC and Egypt. The standard listing in the directory is available to companies in 13 countries; however, the ‘premium’ upgraded subscription-based service was only offered to companies in Jordan, where Arabia Weddings is headquartered. Arabia Weddings launched its Premium Directory subscription in the UAE offering companies that provide products and services to the multi-million dollar weddings market, a great opportunity to promote their services to thousands of website visitors. The upgraded listing provides companies with a mini website that includes the full address, description of products and services, galleries of images and videos, clickable links to websites or social media accounts, room to make announcements and post press releases and a digital map. In addition, the annual subscription service comes with strong PR support that includes social media promotions on many channels including Facebook, Twitter, Instagram, Pinterest and Google+ to add even a greater value to its subscribers. 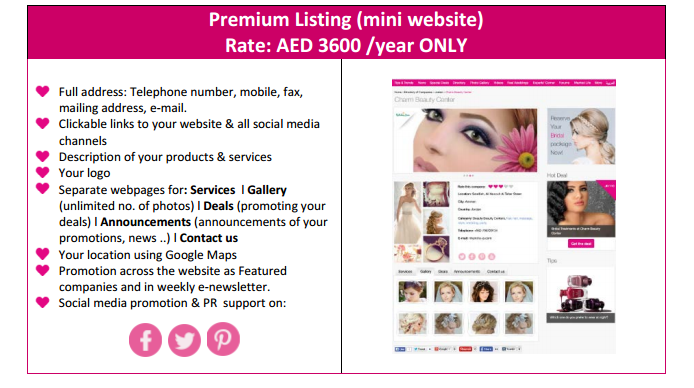 The ‘premium’ directory listing will be rolled out to other Arab countries expanding to Saudi Arabia in May 2014. Once you create your accounton Arabia Weddings by answering a few basic questions, you will be able to save any of your favorite content that you come across on the website. Whether it’s a piece of news, or the latest fashion trend, or an image you liked in any of the galleries you saw on the website, you will now be able to click on the ‘Add to my favorites’ heart-shaped icon and save it in your own personal folders. The new facelift that your personal account got on Arabia Weddings will certainly enhance your user experience on the website and help you get more organized. It is always gratifying to know that the work you are doing is touching others’ lives and making an impact. Above all, it is important for team members to know that their contribution and hard work is appreciated both internally and externally by our users. It’s been a year since we launched the Arabic version of Arabia Weddings which followed the first beta version of the English interface by 5 months. One factor that we have scored high marks on that provides a great sense of achievement and accomplishment, is our users’ feedback and unsolicited comments about Arabia Weddings. We have heard many great comments by brides, and sometime, by mothers of the bride or groom, saying how much they find the website useful and check it regularly for inspiration and advice. But the best comment we’ve heard a few weeks ago, was from a bride-to-be who phoned in praising the website and expressing her love for its content saying “every time I start reading your articles and browse the website I feel like giving the website a very big hug”J. Well, hugs and kisses to all our fans and users. You make us proud of the work we do. With reaching 100,000 fans on our Facebook page we decided to celebrate with our fans! We held a small event at Sa Scene beauty salon where we offered the brides to be many beauty services. No celebration is complete without a cake of course! Check out our Facebooke page!